Here’s a little report that my friend Jed Fitzpatrick, who owns Bitterroot River Guides, cranked out after he and I and a few others floated Montana’s Bitterroot River last week. 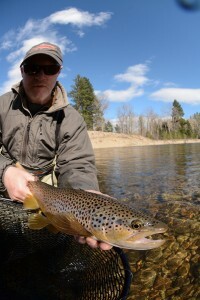 With some colder weather the river is probably on the drop and fishing could be really good right now. Prime time is 2 to 4 in the afternoon. 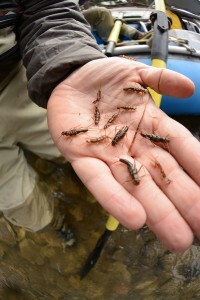 Here’s the dirt, in Jed’s words: It’s turning into another fine Skwala season here on the Bitterroot with tons of nymphs ready to hatch and good fish already looking up for a bug. Our weather took a turn for the better, shooting up to seventy degrees a couple times and really bringing out the solar energy needed to get the bugs hatching. Skwalas are looking for 46 degree water temps before they pop, so we’ve seen the bugs waiting until well into midday to start emerging. This entry was posted in Flies, Montana and tagged Bitterroot River Guides, Fly Fishing the Bitterroot River, Skwala stoneflies. Bookmark the permalink.